A long but fascinating piece on IndexUniverse by Robert Arnott and Denis Chaves earlier this week argued that the normal we all think we are going to get back to wasn’t actually normal at all. By this, they mean that the high levels of economic growth we experienced during the postwar period were a historical blip caused by very favourable demographics. Modern historical “norms” were far from normal: The past half-century-plus has enjoyed a substantial demographic tail wind, which some call a “demographic dividend.” Support ratios tied to our children tumbled, and support ratios tied to our parents and grandparents are only now beginning to soar. Thanks to a fall in birthrates and a rise in the number of adults, the working-age population soared. There was a brief period where the dependency ratio fell as there were fewer children to support. The research found that children and people over 55 have a negative contribution to GDP growth while, for those in between, the contribution peaks somewhere around 30. Our results show that children have a slightly negative effect on economic growth, but young adults start to positively contribute as they join the work force. Skeptics might argue that wages and productivity peak later in life, typically in one’s 40s and 50s. This is generally true, and helps to explain why the most prosperous nations often have a larger proportion of mature adults than the less prosperous nations. However, the definition of a peak, whether for productivity or anything else, is that we stop rising and start falling. When we reach peak productivity, our growth in our productivity is zero! It’s the young adults, in their 20s and 30s, who have the most rapid rate of change in their productivity. One might say that mature adults are terrific for GDP, but not for GDP growth, and that young adults are terrific for GDP growth, but less so for GDP. 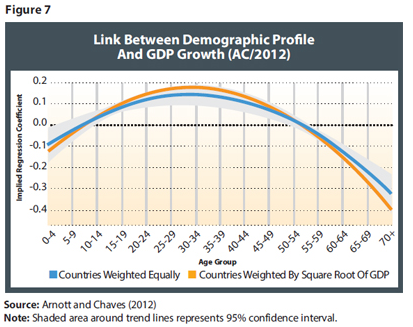 The average contribution to GDP growth becomes negative between 55 and 60. Again, this does not mean that people begin to consume more GDP than they produce after age 55, only that—on average—mature workers above age 55 have passed their peak in productivity. One can readily infer from this graph that the average 60-year-old is more productive than the average 40-year-old, but not so relative to the average 55-year-old. At ages 60 and above, the coefficients decline much more sharply: The mature worker exhibits falling productivity, but in retiring, a worker’s productivity simply falls off a cliff! Low birth rates and higher survival rates gave us a “demographic tailwind” which powered our economies forward. Our main goal in presenting these results is to correct the common misconception that developed countries went through a “normal” period of high growth, as if we are entitled to growing prosperity. A more realistic view is that the favorable demographic dividends of the last few decades were atypical, temporary and are now losing steam. Either way, the coming decades are going to be very different from the recent past, in terms of demography and, if our results are correct, economic growth. The developed world is entering a new phase in which the low fertility rates of past decades lead to slow growth (or, in many countries, no growth) in the young adult population, which is the dominant engine for GDP growth. Meanwhile, the large rosters of mature adults, many of whom are at or near their peak productivity, are poised to retire, creating an impressive surge in the rolls of senior citizens. These newly minted senior citizens, transitioning from near-peak productivity to retirement in a single step, will be drawing on the economy while no longer producing goods and services. The unequivocal good news of a steady rise in life expectancy means that these retirees will create a very substantial drag on GDP growth. The emerging economies are still enjoying their demographic tailwind but they will eventually go the same way as us. Sometime around 2050, the study predicts that the population will stabilise. Some generations hence, we’ll reach a new steady state, in which births equal deaths, with a far larger retirement roster than we have today (but likely smaller than we’ll see in the coming 20-30 years). When we extrapolate from our 2012 research into these radically different demographic profiles, we find that this transition and the eventual steady state may be characterized by negligible (and perhaps negative) real per capita GDP growth. And it’s not just the slow growth that’s a problem, it’s slow growth in an economy where people have come to expect high growth as almost a right. The danger is not in the slower growth. Slow growth is not a bad thing; it’s still growth. The danger is in an expectations gap, in which slower growth is believed to be unacceptable. If we expect our policy elite to deliver implausible growth, in an environment in which a demographic tail wind has become a demographic head wind, if we resist the necessary policy changes that can moderate these head winds, we risk magnifying their impact. If the world is moving towards a beehive-shaped population profile, it is bound to have implications for economic growth, even if we slow the shrinkage of the workforce by working longer or find new ways of boosting productivity. That said, Arnott and Chaves finish on an optimistic note. Economic growth might not get back to industrial levels but that doesn’t mean we are going to go back to pre-industrial poverty. We just won’t get richer as quickly as we did in the past. Nor is it truly “damage” if we’re collectively enjoying the greatest affluence the world has ever seen, are living longer than imaginable in past centuries, and, as a consequence of these happy changes, our affluence is now likely to grow considerably more slowly. The trouble is, most of us have grown up thinking that the postwar world and everything that went with it was normal. We think that, once we have ridden out this difficult period, everything will go back to how it was. We have built a society on the assumption of high economic growth, increasing living standards and high levels of state service provision. Yet the human race is about to embark on probably the greatest experiment in its history. For millennia, only a tiny proportion of people made it beyond 60. By the middle of the century, for most of the advanced and emerging economies, the proportion will be somewhere between 25 and 35 percent. It would be very surprising if that did not radically affect the way the world economy works. What we have seen in the years since 2007 may not be a temporary blip after all but the start of a long period of low economic growth. Those of us who grew up assuming that the postwar world was normal have a hard adjustment to make. WRT the last sentence, it’s not just children of the 1945-73 period who are adrift. People of my very specific age group, between about 26 and 30-something (I am 28), grew up under a similar set of assumptions. Unless their parents were unemployed under Thatcher (and while this group was a large minority it was still a minority), or they fared particularly badly when they entered the jobs market, the “boom” shaped our entire worldview and we knew nothing else. And the fact of it being a fake boom will also be telling. The future will be (unexpectedly) bleak for us too. Whereas Generation X and whatever the youth of today call themselves are a bit more used to the concept of hard knocks. I am talking about the Blair/Brown “no more boom and bust”. Again with the ‘sad donkey’-ism. Look, I don’t dispute that we might see lower average GDP growth going forward; either due to a slow-down in the growth of monetizable investment opportunities, or a demographic shift, or both; but it’s important to focus on the fact that the UK has experienced stagnant economic growth over the past three years, and that this stagnation is directly attributable to the actions of the government. George Osborne has done everything in his power to dissuade businesses from investing, and stop consumers from spending. Makes it look as if you’re making excuses for economic incompetence. Remember, if we *are* going to see lower productivity growth, or demographic imbalances, then we need a sensible set of policies to ensure full employment amongst those who *are* working. Right now the unemployment rate amongst young people is 19.6%. The problem right now is not long term demographic trends, it is a flawed economic policy. Those aren’t curves for the UK, are they?